Our tasting room is finally open for business and may we just say that the city of Saratoga is very excited about that as they strive to make Saratoga a wine destination. We’re more than happy to do our part of course. Picture yourself relaxing our our patio, thoroughly enjoying Michaud Vineyard and Martella wines as you take in the lovely views and watch the world go by. The breeze blows softly, the muted sounds of conversations fill the air. You’re lulled into this feeling of utter contentment and are so relaxed you’re not compelled to move for hours. It’s just too lovely and satisfying. Since we took this photo, we’ve added large red umbrellas to our patio and soon we’ll be serving small plates to pair with our wines. And we have Wi-Fi! What a perfect way to spend an afternoon! Come on by – we’re waiting for you! HOURS: Thursday 3-8, Friday 1-9, Saturday 1-9, Sunday 1-5. Occasionally for local special events, M-W, 4-8. On our “official” opening weekend (August 3 – 5), we rocked the house with non-stop visitors! It was amazing! Friday was so busy we didn’t close until 9:30 p.m. (closing time is 8 p.m.). On Saturday and Sunday, we were full each day from opening to closing time. We did vertical tasting of Michaud Vineyard Chardonnays from 2001 to 2010 (with a few missing years in between). The favorites were our 2001, 02, 03, 05 and 10. They’re all available for sale in our tasting room (and on our Michaud Vineyard website). Test them for yourself and see if you agree. We found some recipes similar to the Sent Sovi wine pairing menu. I’ll be the first to admit, I can’t cook like Josiah Slone of Sent Sovi but I’m going to give it my best shot. Join our Michaud Vineyard Wine Club. Members get free tastings and 20% off all wine purchases at our tasting room. 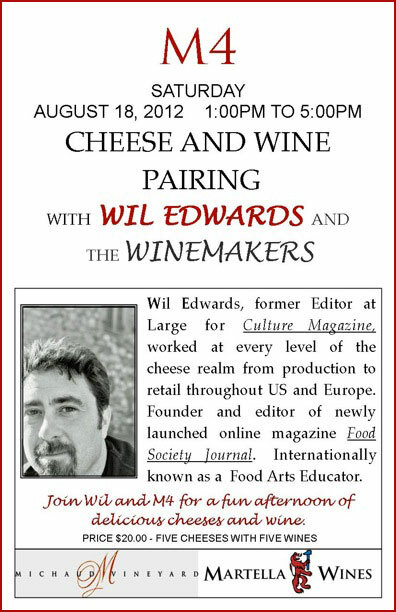 Join us at the Michaud/Martella “M4” Tasting Room Cheese and Wine Pairing Special Event this Saturday, August 18th! 5 cheeses, 5 wines, only $20! Our New Saratoga, CA Tasting Room Grand Opening is August 3, 4 and 5 – Join Us! Our New Saratoga, CA Tasting Room Grand Opening is August 3, 4 and 5. Come on by!! Occasionally for local special events, M-W, 4-8.We have WiFi!